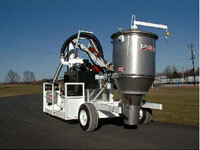 Master Vac is a vacuum system with a gravity dump. 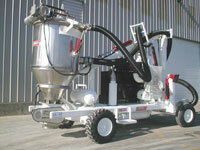 The machine cycles between vacuum mode and dump mode a t a rate of 1000 to 1500 pounds per minute. Conveying products under a vacuum handles commodities very gently never exposing them to heat as in a push pull system. The system automatically cycles between vacuum and dump mode by using a load cell (adjustable for different commodities) that senses the weight in the receiver. Unit is constructed of 304 stainless steel, which is ideal for handling food grade products or materials that can not contact any foreign particles.